Former California Gov. Jerry Brown dropped by Olympia Thursday to share his wisdom on how Democratic lawmakers could enact big legislation to fight climate change. His visit comes as Gov. Jay Inslee presses to pass his latest package of proposals to reduce carbon. OLYMPIA — Former California Gov. 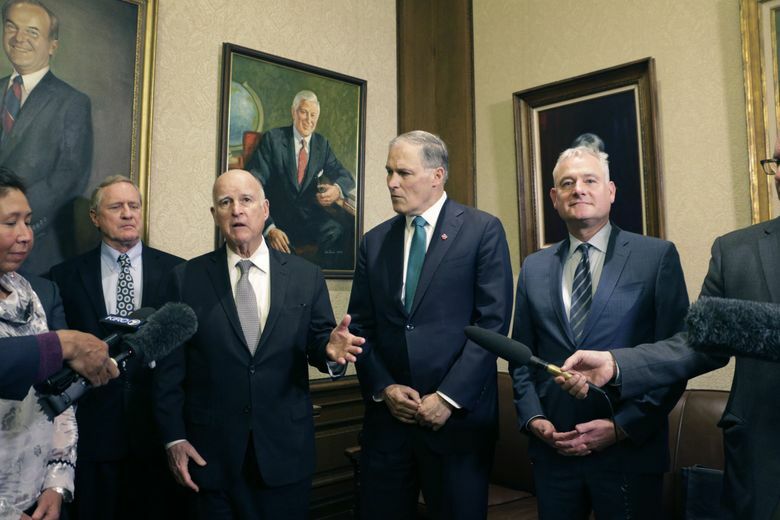 Jerry Brown dropped by Olympia on Thursday to share his wisdom on how Democratic lawmakers could enact big legislation to fight climate change. Brown’s visit comes as Gov. Jay Inslee, after years of seeing his proposals to the Legislature on climate change become stalled, is pushing his latest package to reduce carbon emissions. The visit was also a moment of climate-change déjà vu. Nearly a year ago, former Secretary of State John Kerry visited Olympia to sell Washington lawmakers on Inslee’s carbon-fee proposal. No dice. Kerry couldn’t muster the magic to move lawmakers to pass last year’s plan. And voters in November rejected a statewide ballot measure that would have put a price on carbon. Now, Inslee is hoping that a different type of carbon proposal — a series of smaller bills that he says would have roughly the same impact as his prior plans — will be passed by this year’s expanded Democratic majorities in Olympia. Asked how Inslee could get moderate Democrats and Republicans to support proposals they’ve been skittish about, Brown said moderate lawmakers in California have already taken action. And it’s paid off. Brown, Inslee and dozens of Democratic lawmakers were scheduled to have dinner Thursday evening in the executive residence in Olympia. Inslee’s proposals this year would phase out fossil-fuel power from electric utilities by 2045, propose a clean-fuels standard for vehicle emissions, recommend the gradual elimination of “super-pollutant” hydrofluorocarbons found in air conditioning, add more electric-vehicle incentives and enact stricter energy-efficiency regulations for buildings.